REVOLUTIONARY SNAKE ENSEMBLE returns to Regattabar for the party that has become a Boston Mardi Gras tradition - you will not want to miss it! The evening will feature the return of special guest saxophonist CHARLES NEVILLE, of the legendary Neville Brothers Band. Also joining the band for a few numbers will be electrifying vocalist & New Orleans legend HENRI SMITH. Labeled "explosive" by the Boston Globe, two-time New England Music Award nominees Revolutionary Snake Ensemble's most recent cd "I Want That Sound!" has received extensive critical acclaim, and entered the CMJ jazz radio top ten chart just two weeks after its release. 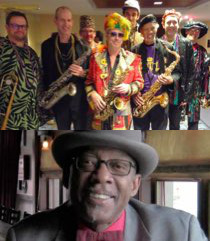 NYC Jazz Record writes that "Revolutionary Snake Ensemble has been putting its unique and somewhat twisted twist on the New Orleans brass band tradition for more than 25 years...hard-partying avant-funk, with boisterous soloing...I Want That Sound! is a strong example of how Ken Field and the Revolutionary Snake Ensemble continue to push the brass band tradition forward in an entirely original way, all the while making music that's a heck of a lot of fun." KBCS Seattle Public Radio says that RSE "continues to mine the vein of New Orleans - with post-bop, and touches of Avant - this band cooks; edgy, raucous, fun, and first rate!" And the Boston Herald adds that "People tend to think of second line bands - brass bands steeped in New Orleans traditions - as instant party starters. It's a great compliment, maybe the best compliment ever, but it limits the sonic and emotional range of these bands. Revolutionary Snake Ensemble can absolutely get a party started. But on the local horn collective's fourth album, "I Want That Sound!," the players also explore the wild outerlands of jazz." Grammy Award winning saxophonist CHARLES NEVILLE is a member of the legendary Neville Brothers band. Born in 1938 in New Orleans, Neville has performed with James Brown, B.B. King, Bobby Bland, Ray Charles, Allen Toussaint, James Booker, Ernie K-Doe, Wilson Pickett, Big Joe Turner, and many more, and has led his own band, Diversity, since 1991. With gold & platinum records in six different countries, Neville has appeared on such popular TV shows as the The Today Show, Oprah, Saturday Night Live, Tonight Show, and Letterman. His ethereal performances at the New Orleans Jazz & Heritage Festival have made him an annual fixture there. Vocalist HENRI SMITH has been thrilling New Orleans audiences for years with his sophisticated swing and dramatic delivery of jazz, blues, and Cajun flavored music. He relocated to Massachusetts in 2005 after losing his home to Katrina. New Orleans born and bred, Smith has long been a radio personality on the legendary WWOZ, where his radio show featured the contemporary jazz that he loves and now sings professionally. With many connections in the music world, he frequently served as emcee and vocalist at the New Orleans Jazz & Heritage Festival for artists such as Kermit Ruffins and Ellis Marsalis.